I almost feel bad for Secretary of State, John Kerry. This really has been a brutal few days for him. If any one of Kerry’s dreams comes true, the world would be better off, so I hope skeptics like me will be proved wrong. If not, this secretary of state will be remembered as a self-deceiving bumbler — and his successor will have some large messes to clean up. The op-ed inspired this tweet, from New York Times White House reporter Mark Landler, a big administration fan. When Kerry landed in Geneva Friday, only a few small details were left to sort out before striking an agreement. But the problem wasn’t the Iranian side, rather it was France that wouldn’t sign off on the “bracketed text” in the draft document. In other words, after misleading the Israelis, the administration had hoped to present the deal as a fait accompli. In scuttling the agreement, French Foreign Minister Laurent Fabius saved the day—for the time being. If those allegations are true, then the US is guilty of of diplomatic malpractice of the first order. This has been followed by Bret Stephens with Axis of Fantasy vs. Axis of Reality (or use Google Search to get there.) After familiarizing us with Wendy Sherman’s career, he gets to his target. Again, it is the Secretary of State. But the French also understand that the sole reason Iran has a nuclear program is to build a nuclear weapon. They are not nonchalant about it. The secular republic has always been realistic about the threat posed by theocratic Iran. And they have come to care about nonproliferation too, in part because they belong to what is still a small club of nuclear states. Membership has its privileges. This now puts the French at the head of a de facto Axis of Reality, the other prominent members of which are Saudi Arabia and Israel. In this Axis, strategy is not a game of World of Warcraft conducted via avatars in a virtual reality. “We are not blind, and I don’t think we’re stupid,” a defensive John Kerry said over the weekend on “Meet the Press,” sounding uncomfortably like Otto West (Kevin Kline) from “A Fish Called Wanda.” When you’ve reached the “don’t call me stupid” stage of diplomacy, it means the rest of the world has your number. Reading through these articles what emerges is a portrait of a man who is ill suited for diplomacy. But not everyone views Secretary of State Kerry in such a negative light. There is, for example, the New York Times. In an article Iran Balked at Language of Draft Nuclear Deal, Western Diplomats Say, three reporters, including the aforementioned Mark Landler tell us the legend of John Kerry. Many reports have ascribed the failure of the talks to France’s insistence that any agreement put tight restrictions on a heavy-water plant that Iran is building, which can produce plutonium. But while France took a harder line than its partners on some issues, a senior American official said it was the Iranian delegation that balked at completing an interim agreement, saying that it had to engage in additional consultations in Tehran before proceeding further. A senior American official who briefed Israeli reporters and experts in Jerusalem on Sunday said that the six world powers in the talks had approved a working document and presented it to the Iranians, according to Herb Keinon of The Jerusalem Post, who attended the briefing. Read that middle paragraph again. Understand how it finesses what happened. It decouples the French toughness (did I really write that?) from the effect of having the Iranians go back for consultations. If the sequence had been written straightforwardly, the Iranian refusal to accept the deal would have been presented as a consequence of France taking “a harder line.” But that would imply that the Iranians had walked all over Kerry until he was bailed out by France, and that would just not do. The Washington Post wasn’t much better, presenting Kerry (and the administration, generally) as a victim of those who are skeptical of the deal. On the final leg of a 10-day trip to seven countries, Kerry said criticism of the proposed Iran accord is premature and ill-informed. The Arak reactor, ostensibly designed for medical research and isotope production, has raised proliferation concerns because its spent nuclear fuel could be reprocessed to extract plutonium. Highly enriched uranium and plutonium can be used as fissile material in nuclear weapons. Iran has denied any plans to build nuclear weapons. Over 1500 metric tons of plutonium have been produced world wide, some for weapons use, and most of the rest as a by-product of electricity production. It is important to note that the plutonium produced as a by-product in a nuclear power reactor is created in its many isotopic forms, including Pu-239, Pu-240, Pu-241, and Pu-242. This is known as “reactor-grade” plutonium. In contrast, “weapons-grade” plutonium contains almost pure (over 90%) Pu-239. Plutonium-239 is created in a reactor that is specially designed and operated to produce Pu-239 from uranium. The reactor at Arak is a heavy water reactor, which is the kind that produces Plutonium 239. The reporter here hasn’t done her basic homework. The intent to build the Arak reactor is what shows that the Iranian nuclear program is not peaceful. You don’t produce Plutonium-239, weapons grade plutonium, by accident; you have to intend to. Writing about “medical research” and the nonexistent “nuclear fatwa” with no skepticism is not reporting. It is repeating talking points. It is Kerry, not his critics, who is “ill-informed,” but you won’t get that from the Washington Post. On any objective level, this has been an awful week for the Secretary of State, but you wouldn’t get that from reading the news pages of the New York Times or Washington Post. 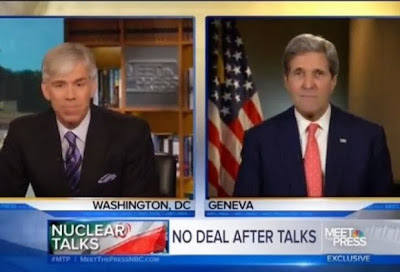 Technorati Tag: John Kerry and Iran and Media Bias.